I have a blog post I want you to look at. Emily has shared how a particular verse has inspired her to twirl! "I had read the verse before, but I read it this time with fresh eyes. He will take great delight in you … He will rejoice over you with singing. Well, no wonder He wants me to twirl, I thought. It’s because He is the one doing the singing!" I hope you enjoy her post as much as I did! We feed the dogs and have their water bowl near where we feed Zeke. Sometimes Zeke starts throwing his food to the floor and some pieces get into the water dish. Snoopy has figured out how to get the food off the bottom of the water dish. He puts his whole nose under water and blows as he grabs the food. sorry- I tried to get the video posted here- but it didnt work! I have found a splash pad to play with Zeke in, but it is in Hickory and is only open 2 more weekends. Yesterday Deborah and I went to the Y and they were closed. This morning Dave dropped me off at Deborah and Aaron's house while he went off geocaching. We packed up and went off to the Y today. The pool was open at 11 and we were there until at least 12:30. Zeke had a lot of fun splashing in the water and going down the slide. I think E had a lot of fun too! Well I have completed another Quilt! This one I have given to Pet Partners to use as a raffle. I am selling them as well as any Pet Partners volunteer. Draw will take place Nov 20th. at the Adopt-a-Pet Event. The quilt is a black, white and red coin quilt. It measures 44x58 inches making it a lap throw. It has both dogs and cats on it for the animal lover but they are not overwhelming for those who are not. This quilt would be a perfect Christmas gift for someone. Well we gave zeke his first Ice Cream while Ryan and Christine were here. We went up the the Tanger Outlet in Blowing Rock after supper for some ice cream. Of course Zeke couldnt just let us eat ours in peace. Dave gave him a bit of his ice cream - Georgia Peach. At first he didnt like it- I think it was the coldness. Taking a hint from Kendra's Date Night, I went to the blockbuster to rent "Date Night"
I think this should get us though the weekend eh? Tonight is Date Night. We are going to feed Zeke and then get Chinese food later and watch Movies when he is in bed (maybe start one when hes up). Some of you read Daves Blog, others do not. This post is for those who do not. On Fridays I go to Baby Time with Zeke at the Hickory Library. Usually after this we go on to get things we need in Hickory or we go home. This week we decided (Deborah and I) that we would go to the Catawba Science Center. We had found out a while ago that it is FREE on Fridays. Deborah and I have both taken advantage of this on separate occasions but not with both our boys. They have a butterfly exhibit on that I wanted to see. We walked over since its in the complex as the library. They even put sugar water on your finger to attract the butterflies- I didnt as I was carrying Zeke with one arm and the camera in the other. We then went to the art gallery for a few minutes but the boys got bored with it. We headed over to the interactive fun for kids section. saw a tortoise and a moose head. Then it was time for some fun! I have been volunteering with a group called Pet Partners Network. they are a group that is trying to get a "No Kill" shelter in the county. Last year the county put down close to 5000 (yes- five thousand) animals. I love the black, red and white together. I have it basted and ready to quilt it- its getting there. The back is more grey to hopefully not have too much hair show up on it! I am thinking of quilting it on my machine- it will be a lot faster and doing it in a diamond pattern. I think tickets are going to be $1. So come out to an adopt-a-pet event and get your raffle ticket soon! 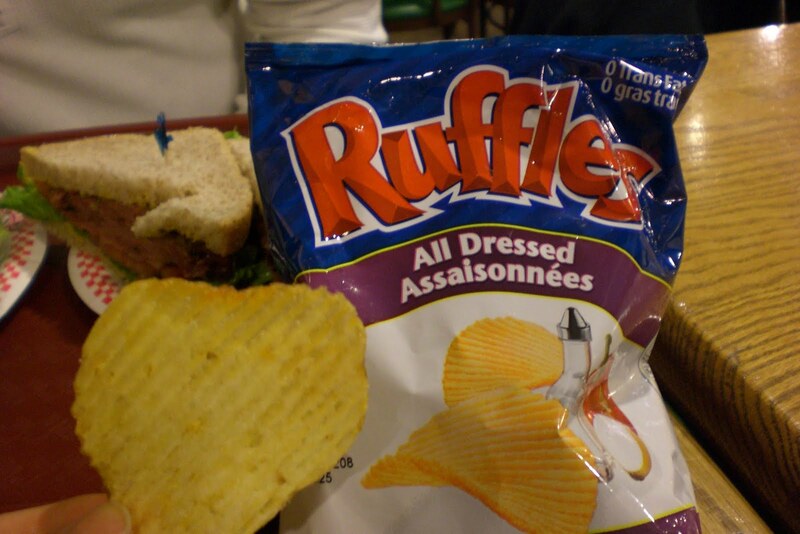 I have opened my last bag of all dressed chips from canada. Its a rather sad moment for me as I cannot get this flavour in the states. This bag will probably last us a couple days of a bowl to share a day. As we have no immediate plans to go back to Canada, so I will have to wait until someone comes to visit us here. There are a few products that I miss down here. I know Dave misses Shreddies. What is something that you miss from where you grew up?